Welcome, Pluto Lovers! This website seeks to introduce astrological professionals and students to the rather substantially-sized celestial objects in the Kuiper Belt that are mighty Dwarf Planet Pluto's neighbors. These planetoids are not small potatoes, even if some are slightly elongated, like a potato (continued below). Can Astrologers Develop Time DNA? 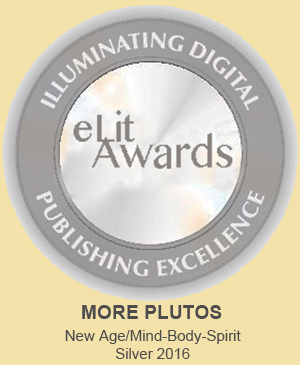 GET AN AUTOGRAPHED COPY of MORE PLUTOS . 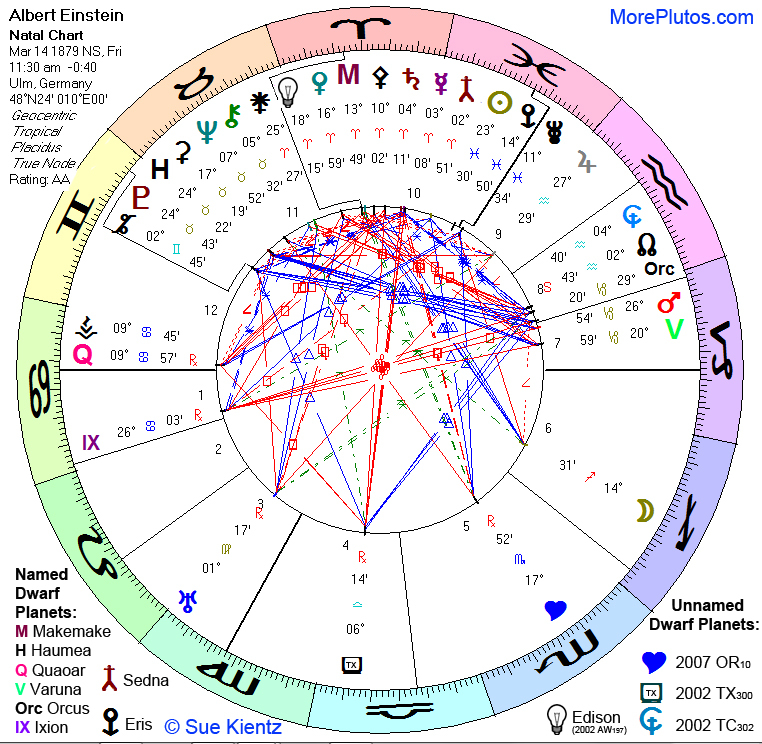 Sue Kientz will sign and personalize her award-winning book for you, and even include a print-out of your birth chart displaying your Dwarf Planet positions (chart only, no interpretation; see example). Cost: $39.50 plus $6.50 priority mail shipping. Pay via PayPal (put your birth date/time/place in PayPal's "Special Instructions"), or e-mail for alternate method. Supply is limited. Why proclaim them MORE PLUTOS? This happy refrain is in homage to the thousands of astrologers all over the world who, when they heard that the International Astronomical Union declared Pluto no longer a "real" planet in 2006, went about their business unperturbed. However, these same diligent astrologers might not appreciate that just as they value Pluto's essential usefulness in their charts, they should know that there are MORE such objects, that's right, MORE invaluable, indispensable worlds just like their best buddy PLUTO! If you are an astrologer who has a clientele, or you are a serious student of astrology, you need to check out these fantastic Kuiper Objects. Don't be fooled by the astronomical community's seeming dismissal of them as too small to be significant. The Dwarf Planets covered in MORE PLUTOS are all larger than any asteroid (considering Ceres is now classed a Dwarf Planet), except for one that is small but unusually bright. Every one of them is larger than Chiron, and how many astrologers use Chiron? Quite a lot. Eris is very close to Pluto's size, making them a pair just like Jupiter/Saturn and Uranus/Neptune. And like those other pairings, Eris is the antidote for Pluto, not some Warrior Princess which would make it more like a female Pluto. Eris is Other, the experience of those alien to us, and brings the possibility of understanding and working with Others rather than demonizing those who are different. If Pluto seeks power and control, Eris strives for reconcilation and decentralizing of power. Tied for third-largest body in the Kuiper Belt, Makemake's emphasis in a chart can indicate electrifying genius or shocking criminal tendencies. Think of Makemake as a super-Uranus, and read how it explains unique personalities like Dali, Edison, Mozart, Benjamin Franklin, and many others. Sedna is our solar system's slowest planetoid, and appears to combine the natures of Saturn and Neptune. When Sedna is present in birthcharts or transits, expect determined and even obsessive behavior for good or ill. The book MORE PLUTOS, available on Amazon and other online booksellers (see list and links above right), is a comprehensive guide that covers the above mentioned Dwarfs as well as Haumea, Quaoar, Orcus, Varuna, Ixion, 2007 OR10, 2002 AW197, and 2002 TX300. Each object's meaning is defined using examples from both history and the recent news, including various historical figures and events spanning over 2,000 years. MORE PLUTOS covers events as recent as the Germanwings 9525 tragedy, all the way back to the reign of King Tutankhamun, which began in 1332 BCE. Guaranteed to be both informative and entertaining, MORE PLUTOS just might revolutionize your astrological chart work if not your entire perspective. Why? Because this book will show that the Dwarf Planets not only enable the most elegant window into Time ever, but they will help astrologers construct a damn good theory of why astrology works, and how. Not since Wegener needed to know about oozing sub-sea magma has any group of dedicated professionals desperately needed a foundation on which to stand. BONUS! Did you know there are cousins of Pluto in the Asteroid Belt? The second-largest asteroid, Vesta, has been considered a Dwarf Planet candidate, and is quite a useful little workhorse. See Tidy Vesta Can Warn Us of Messy Disasters, which appeared in the Journal of Research of the American Federation of Astrologers, vol. 15 (April 2015). except for New Horizons' latest images of Pluto!